» Product Reviews » Microsoft Hololens Preview, Augmented Reality in 2015? « Omni Virtual Treadmill, Is This The Future of VR? Microsoft Hololens Preview, Augmented Reality in 2015? Let’s take a look at the recent Microsoft Hololens preview, is augmented reality evolving in 2015? This next wave of technology is going to be amazing! Microsoft recently did a Hololens build preview and it looks quite astonishing, check it out! It’s pretty exciting! This is a very potential future for computing and everything dealing with the internet and much more, we’re on the brink of a total shift in our technology. I know for certain that I’ll be including this kind of technology into my life! How will this affect the PC gaming industry? Will our games be played in an augmented way? I wonder if Steam would integrate it’s services into this augmented world of technology that we’re starting to embark into. The fact that our power of overall technology doubles every single year puts me in awe because I can’t even imagine the kinds of technology that will come out in the next 5, 10, even 20 years. I wonder if this will be integrated with our keyboards and mice? Imagine playing Counter Strike: Global Offensive in your living room and the game actually becomes your living room. The possibilities are endless when it comes to this technology literally anything we can think of we can most likely manifest into an augmented world. HOW SOON WILL THIS RELEASE? Windows 10 is set to release this summer. This device runs off of the Windows 10 operating system so it can’t be too far from the Window 10 release right? Would we be walking around in first person mode with Minecraft playing it survival mode? Like I said, the possibilities are infinite when it comes to this technology! I’d like to hear what you guys think will happen with this technology. Not just on the gaming side of things but on the business side as well, how will marketing be done in an augmented world? Do you think this technology will explode and become viral much like how smart phones and social media has? Tagged augmented reality, microsoft hololens, virtual reality. Bookmark the permalink. 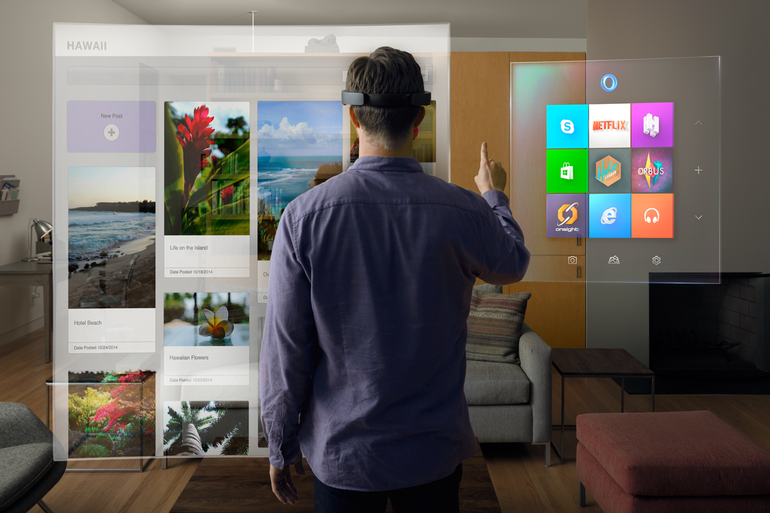 16 Responses to Microsoft Hololens Preview, Augmented Reality in 2015? Hey there! I can’t believe the video I just saw! This is amazing! I was starting to get disappointed with the Software Giant and this put them up a few notches on my book ;-). So cool! I have bookmarked this page and will share around. I for one can’t wait for new technology to come i am one of those that like to move into this new world of technology. As i have just got the new smart phone from Samsung it is great still trying to work it all out but that’s the challenge love new tech. This is definitely one of my favorite articles that I’ve read so far. And it will probably release so soon! I can’t wait to see where it leads to. I think this technology is so cool. It’s amazing how technology keeps moving forward. The only thing I don’t like is having to wear those darn technology eye wear. I like my eye make-up. I hope they change that with something smaller or place it somewhere else. Yeah, there are dev teams that are creating contact lenses that will essentially do the same exact thing as shown here with Microsoft’s Hololens but I’m not sure how I really feel about sticking all of that technology right on my eye balls….it’s kind of overwhelming to think about! We also have devices like Google Glass to look forward to, the future of this tech is moving very fast and I’m super excited to see what happens with it! Looks like so much fun! I have a 14-year-old son. Amazing technology is in his future! This is so helpful. Provided the exact information I was looking for! I’m definitely going to bookmark it for later visit. Truly amazing technology! I can still remember waiting for radios to ‘warm up’ before hearing music and the arrival of the first 6 transistor AM radio. We’ve come so far in such a short time! Technology doubles in power every single year, it’s so crazy that we are already to this point in technology!